There are numerous upgrades to various items found throughout Twilight Princess. This guide is here specifically to list those upgrades, and to give the locations of each upgrade. After clearing the Goron Mines, head over to Barnes Bomb Shop in Kakariko Village. For 120 rupees you can purchase the first Bomb Bag, already filled with regular Bombs. After clearing the Twilight from Lanayru Provience, head over to Upper Zora's River. Speak with Iza, next to the house above the river, and she'll invite you in to help her with a problem. Bomb the boulders inside with a bomb arrow, and she'll have you hop in the boat, to help clear some more down the river. Before you do though, she'll give you the second upgrade to the Bomb Bag. After clearing the Twilight from Lanayru Provience, head over to Zora' Domain. If you can't change to wolf form, go to the northernmost point of Hyrule Field, and through a cave that leads to Zora's Domain. Bomb the boulders on the way up to get to the top. Once inside the throne room, equip the Zora's Armor and Iron Boots, and sink to bottom. Here, you'll find a large boulder, blow it up with water bombs. 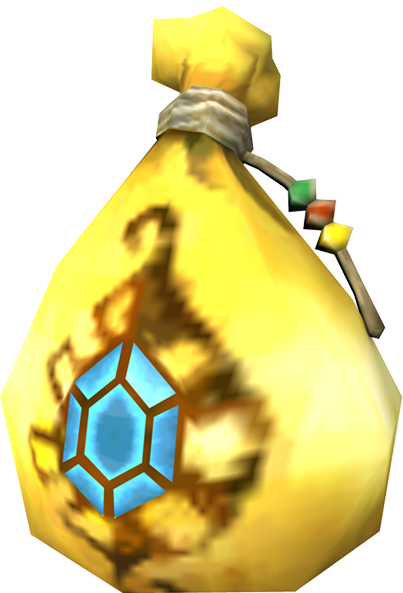 Inside, is a Goron who will give you the third Bomb Bag upgrade. After clearing the Twilight from Lanayru Provience, head over to Upper Zora's River. Speak with Iza, next to the house above the river, and she'll invite you in to play her game. The goal is shoot down 25 pots that are strewn across the river, with yellow pots being worth 1, red being worth 2, and hitting a wall resulting in -1. You need to get at least 25 out of 30 points to win the game, and at the bottom, you'll receive the final upgrade, the Giant Bomb Bag. Donate 1,000 rupees to the Elder Goron in Kakariko Village(Malo Mart) to help restore the bridge to Hyrule Castle Town. Accept mission and bring the barrel of water to the Goron at the bridge. Throw the barrel of water on him, he will give you a heart piece. Return to Malo Mart and donate 200 rupees (only if you completed the last two steps, otherwise you will have to pay 2000 rupees). Wait until you recieve a letter talking about the new Malo Mart in Hyrule Castle town (at the shop you couldnt enter before). You can now buy the Magic Armor for 598 rupees. 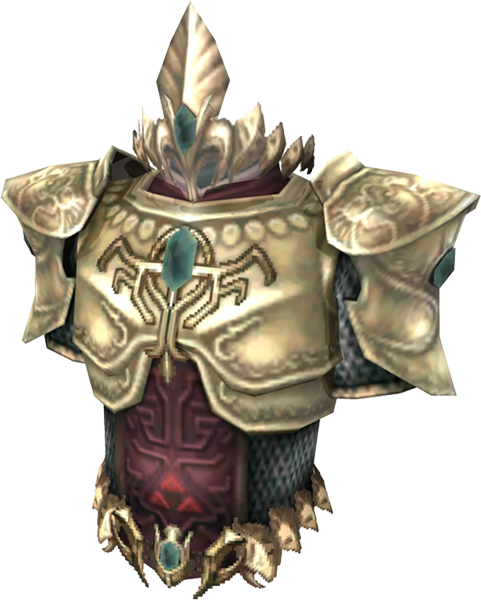 Note that wearing this armor takes a great amount of rupees away, so use it very wisely. In the Goron Mines, after defeating the mini-boss Dangoro, you will enter the room with the dungeon item, the Bow and Arrow. You will automatically obtain the first Quiver, which can hold up to 30 arrows. After clearing the Twilight from Lanayru Provience, head over to Castle Town, and into the STAR game. The goal of this game is to collect all of the stars in less than 30 seconds. Use your Clawshot to move around the cage, and collect the different stars. Once completed, you will recieve the second upgrade, the Bigger Quiver, which will hold 60 arrows. After clearing the City in the Sky, and finding the Double Clawshots, head back over to the STAR game in Castle Town. Play the game, and this time there are even more stars to colllect. Use the Double Clawshot to get around the cage, progressing from bottom to top. Complete the game in under 90 seconds, to recieve the final upgrade, the Giant Quiver, which will 100 arrows. The first wallet in the game is the one that you start off with, it holds only 300 rupees. After clearing the Twilight from Lanayru Provience, head over to Castle Town, and into Agitha's House. Speak with her, and she'll ask you to collect Golden Bugs for her. Find one Golden Bug across Hyrule, give it to her, and you'll receive the first upgrade, the Big Wallet, which will hold up to 600 rupees. Check out our Golden Bugs Guide for detailed maps, screenshots and text to help guide you to their locations! After collecting all 24 Golden Bugs, head over to Agitha's House. Give her all 24, and she will give you the final wallet upgrade, the Giant Wallet, which will hold up to 1,000 rupees.